Yesterday, I needed to go between Moorgate and Tottenham Hale stations. It was just before the evening Peak and I took the escalators down to the Northern City Line platforms, where a new Class 717 train was waiting. The increased capacity meant I got a seat and I took the train three stops to Highbury & Islington station. It was then just a walk through a very short tunnel to the Victoria Line and a train to Tottenham Hale. It was so much more relaxed than squeezing into a crowded and very elderly Class 313 train. After the timetable change in May, there will be eight trains per hour (tph), as there is now, but given the number of trains in the new fleet and signalling improvements in the pipeline, I feel that this frequency will be increased. It should also be noted that in the Peak there are twelve tph, which in the future could be used all day. But in the interim, trains with extra capacity will be very welcome. These developments are either underway or planned for the next few years. Improved signalling on the Northern City Line. Full step-free interchange at Finsbury Park between Moorgate services and Thameslink, Piccadilly and Victoria Lines. 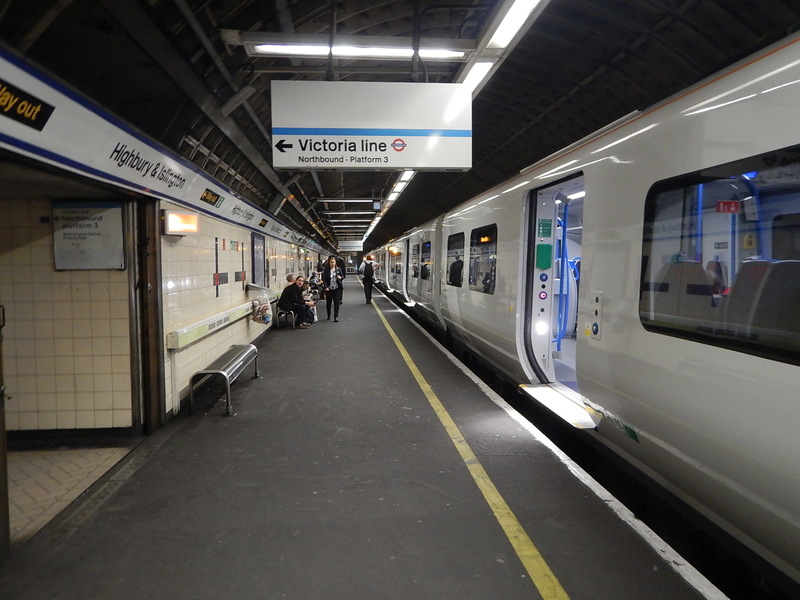 Full step-free access to the Northern City and Victoria Lines at Highbury & Islington station. Full step-free access at Old Street station. Hopefully, Essex Road station will be cleaned. Crossrail will finally arrive at Moorgate station. North London’s ugly ducking, which has caused passengers, British Rail and London Underground, so much trouble, will finally have turned into a swan. I always wonder if the City of London;’s transport planners, wish that the Victorians had built the planned extension to a new Lothbury station, close to Bank. What Will Be The Ultimate Frequency? Currently the frequency between Alexandra Palace and Moorgate stations in the Peak is twelve tph. Compare this with the following frequencies. Crossrail will be initially 24 tph. The Piccadilly Line is currently at 24 tph between Arnos Grove and Acton Town stations in the Peak. The Victoria Line is currently at 36 tph. I don’t think it unreasonable that a frequency of at least twenty tph between Alexandra Palace and Moorgate stations is possible. Digital signalling and Automatic Train Control will be possible. If Dear Old Vicky can turn 36 tph at Brixton and Walthamstow Central stations, with two platforms, then surely 20 tph at Moorgate is possible. Alexandra Palace to Moorgate is a double-track railway, that is almost exclusively used by Moorgate services. Twenty tph would make the cross-platform interchange with the Victoria Line at Highbury & Islington station very efficient. There are two branches North of Alexandra Palace station. The Hertford Loop Branch has three terminal stations; Gordon Hill, Hertford North and Stevenage stations. The East Coast Main Line has a single terminal at Welwyn Garden City station. I could see the following frequencies. It will be a very high-capacity Metro into Moorgate. There will be a need for a few more trains. Should The Northern City Line Be Shown On The Tube Map? Increasingly, passengers will use the high-frequency Southern section of the Northern City Line between Alexandra Palace and Moorgate stations, as a new tube line. So like Thameslink, the arguments will start as to whether this line should be on the Tube Map. If Crossrail is to be shown, it is my view that nThameslink and the Northern City Line should be shown too! Crossrail is in TFL control and will therefore be shown on a tube map all the route from Reading to Abbey Wood/ Sheffield. But as TFL don’t control Great Northern to Moorgate or Thameslink services TFL won’t show them on the standard tube map ! It’s more a political decision and may not be resolved until service is transferred to TFL control in the future. Meanwhile passengers changing from the Overground at Highbury and Islington heading for Moorgate using a tube map will transfer to the Victoria Line at Highbury then change to the Northern Line at Kings Cross when they could have gone direct on Great Northern service but have this information on their map . This is major reason this Line remains under used outside rush hours. Ironic how you mentioned getting a seat on a new train given greatest complaint about these trains is they have fewer seats than existing trains . It was just before the Peak! I travel regularly to Moorgate on both the Northern City and Northern Lines and it is surprising how many passengers only do one stop, as they do on the Overground. It would be very interesting to see travel patterns in this area, because that will drive TfL and Great Northern to increase services. Had Lothbury been built, while it is explained the proposed route could not be extended further south to Bank due to the tunnels at Princes Street for what became the Northern Line. Could the Northern City line have instead avoided Princes Street by traveling from Lothbury to Queen Victoria Street (a proposed station for another scheme at one time) towards the area around Queen Street / Upper Thames Street or Queen Street / Cannon Street (both also the proposed sites for a station more than once over the years)? Or would such changes have entailed a better adjusted route (and the acquisition of more nearby property), with the line pointing in a more southwest instead of southeast direction at Lothbury? The Old Street – Moorgate – Bank – Monument- London Bridge is a busy route through the City. There are four bus routes more-or-less serving the route.I think in the next decade someone will come up with some form of battery powered transport, that would run on the surface, stopping every 100-200 metres or so, with perhaps one vehicle per minute.